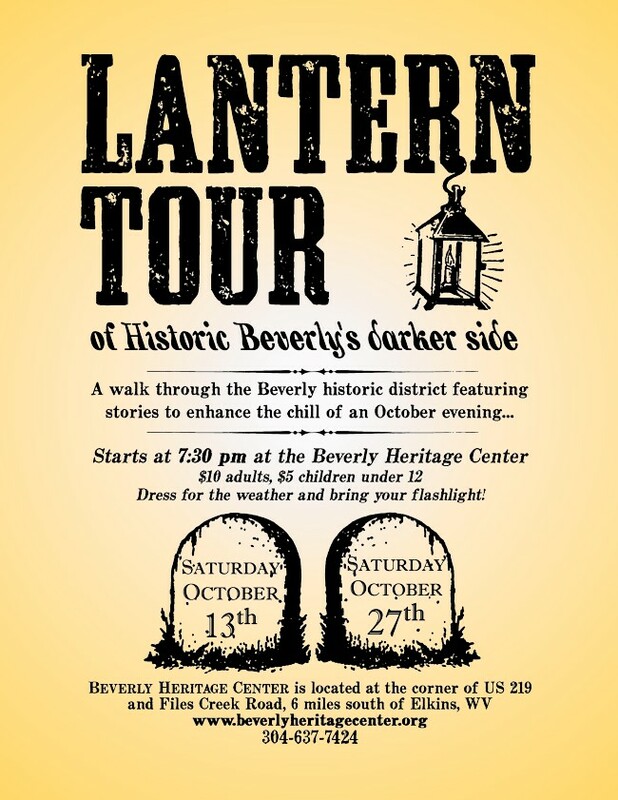 Experience the stories of some of Beverly’s by-gone days on the upcoming Lantern Tour of Historic Beverly. Beverly resident Karl Mulac and other docents in period costume will lead you along Beverly streets sharing history and local traditions related to some of the historic buildings. The Lantern Tour will be held on Saturday, October 13 and Saturday, October 27, at 7:30 p.m. The tour will begin and end at the Beverly Heritage Center and will last approximately an hour and a half, with light refreshments and discussion afterwards. Tickets will be $10 for adults, and $5 for Beverly Heritage Center members and children under 12. Participants are encouraged to dress for the chill of the evening and to bring your own flashlight. Also on October 27, the Beverly School PTO will be holding their fall carnival from 6:30 to 9:00 p.m. Activities will include a cakewalk and silent auction at the Beverly Fire Hall, with additional activities at Tygart Valley Ministries including a costume contest, pumpkin carving, best decorated cake contest, haunted hay ride, pumpkin bowling, and a variety of other carnival activities. The Beverly Heritage Center combines four historic buildings into one heritage attraction offering museum exhibits, gift shop, archives, and visitor information. It is located in the center of Beverly, six miles south of Elkins, West Virginia, on US Rt 219. Operating partners in the Beverly Heritage Center are Historic Beverly Preservation and Rich Mountain Battlefield Foundation. Additional upcoming activities include Night at the Museum fundraising reception on November 10, and Beverly Old-Fashioned Christmas December 1. Off-season hours for the Beverly Heritage Center are Thursday through Monday 11 a.m. to 5 p.m., with other days and hours by appointment.